Elysium. 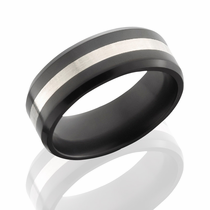 Elysium rings are solid black diamond through and through. There is no material harder in the world. Diamond. 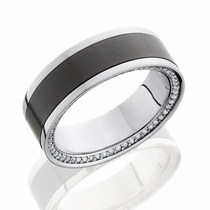 Yes, these rings are solid diamond - black diamond. Your Elysium ring will last forever. The only thing that can scratch it is another diamond. It will always maintain it's original color and shine. For most of history, it was the women who got all the diamonds. Maybe a guy would have a diamond in his ring, or a few diamonds at the most. But now you can have an entire ring made of diamond. Imagine wearing over 20 carats of diamond on your wedding finger. Now it is possible - without spending half a million dollars. The technology required to make these solid diamond rings took decades to develop. Tens of millions of dollars went into developing the processes, and it is finally available to you. There is no other ring in the world that is like the Elysium black diamond ring. You won't scratch it, wear it out, or bend it. It's permanent. Diamonds are forever. 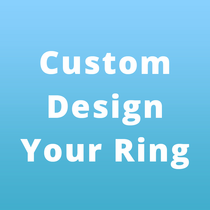 Custom Create and Design Your Own Ring! 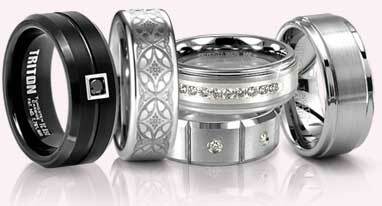 Making wedding bands comprised entirely of diamond seemed like a dream to many. But with nearly 20 years to develop the technology, scientists have finally done it. And we are told it took over $32,000,000 in product development. (Yes, that's 32 million!) There are 7 patents that have been issued. Truly a revolutionary wedding band. Yes, they are made of solid diamond. These are Polycrystal Diamonds (PCD), which are laboratory engineered and created diamonds. PCD are genuine diamonds, but are not mined. As you probably know, diamonds are the hardest natural substance in the world. The only thing that can scratch a diamond is another diamond. Millions of real diamond crystals (20 - 25 million) are fused together using a diamond press. 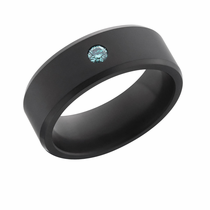 They form a solid polycrstyalline diamond. The crystals are heated to over 1600 degrees and the press uses a million pounds of pressure. Due to the tremendous pressure and temperatures, the individual diamonds grow together by overlapping their molecular structures. The way the individual diamond crystals are arranged during the sintering process produces a solid that does not allow the penetration of light. 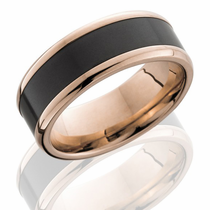 This causes the Elysium diamond rings to be black. Will the color fade over time? No, the color goes through the entire ring and is permanent. It will never fade or wear off. 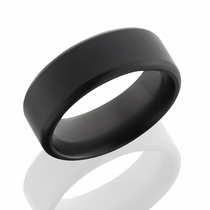 Can the ring be cut or broken off in case of an emergency? Yes. Use a pair of vise grips or a ring cracker. Due to the nature of the material, there is a slim chance these can break. If your Elysium ring breaks within one year you can send it back for a replacement. This will cost nothing to you other than return shipping charges of the new ring. After 1 year: If your Elysium diamond ring breaks after one year of purchase the manufacturer will replace the ring for a fee of 20% of the original purchase price. Within the 1st 6 months, size exchanges have a 25% deductible of what you paid for the ring. After the 1st 6 months and up to 5 years from purchase date, it is only a $79 size exchange processing fee � including FREE shipping back to you!